How to practice the "aggressive" way* of Field Stabilization? * Almost all of the vital therapy of serious emergencies can be performed on the spot. When carried out before transportation (without delaying admission considerably), this increases the likelihood of survival and reduces the risk of complications. In this new book, emphasis is placed on the more complex procedures that the physician may perform, and the various challenges to be met. Also the Emergency Room staff can learn from these strategies. 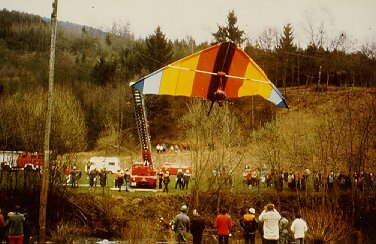 Difficult rescue of delta-flyer after interruption of the electricity supply to a nearby village. ...This is a well-written, important book ... It is also one of the few books to describe in detail clinical lessons from prehospital practice. Furthermore, there are many good clinical lessons in this book that can be applied to our current anesthesia practice in the US ... John K. Stene, Anesth Analg 1992;75:1078-79. ... In total, the book provides an abundance of important and valuable considerations of the experienced emergency physician ... It represents almost ideal reading for the colleagues who aim at testing and enlarging their own areas of experience ... L. Lampl, Notarzt 1993;9:82. ... This book is for afficionados; it is essential reading for far-sighted EMS providers who are also able to learn from the experiences (and mistakes) of others. ... [The author's] anesthetic and European background flavour the presentation in a way that challenges American emergency medicine to strive for a higher standard. Thomas E. Knuth, ITACCS Newsletter 1993;4:36-8.